A hot-looking, high-performance motorcycle jacket without all that weight? Yes, ma'am. 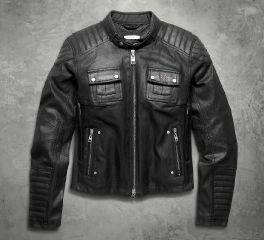 Harley-Davidson textile motorcycle jackets – denim and more – are built for riding in warmer weather and still make a statement even when you've parked your bike. Warm, lightweight, versatile…three spot-on descriptions of the FXRG® Thinsulate™ Mid-Layer. 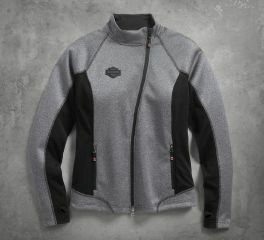 The quilted body features 3M™ Thinsulate™ Insulation, praised for its lightweight warmth. Back perforations release body heat so you don't get too steamy. 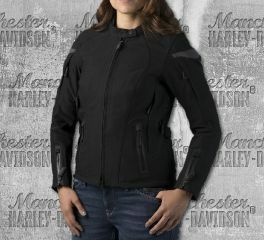 Soft, fleece sides and sleeves keep this women's jacket trim to avoid bulk under your gear. Wear it with FXRG® jackets because it increases cold-weather protection; wear it alone because it just looks great. (Takes up little space—roll and stuff in a bag as weather insurance). Materials: 100% nylon ripstop body. 95% polyester, 5% spandex fleece sides, sleeves, and shoulders. Stay Warm: Compatible with FXRG® Thinsulate™ Mid-Layer (98269-19VW, sold separately) for customizable warmth. Fit & Mobility: Pre-curved sleeves. Bungee cord and toggle hem. Snap waist tabs. Jacket-to-pant back zipper attaches to FXRG® Waterproof Overpant (98267-19VW, sold separately) for full coverage. Pockets: Zipper hand-warmer pockets. Interior Faraday pocket for increased information security. Additional interior pockets include one stash pocket, one zipper pocket with media port, and three credit card slots. 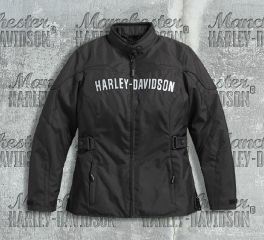 Harley-Davidson® Women's Monovale Riding Jacket features a full snap and front zipper, snap collar, two waist pockets, and one pocket on left sleeve. It also has two chest pockets, and one on right arm. This sleek Monovale Riding Jacket pulls off a military feel and rebellious edge at the same time, packing a punch with features that keep you in comfort, no matter what the season or weather. Abrasion-resistant 600D 100% polyester/PU with polyester mesh lining. Removable zip-out quilted full-sleeve warmth liner. EN 1621-1 CE-approved removable body armor at shoulders and elbows. Back body armor pocket. Slightly pre-curved sleeves and adjustable waist tabs. Two zippered hand-warmer pockets. One horizontal interior pocket. Removable warmth liner features one horizontal pocket. Embroidered graphics on left chest and back yoke. Meets or exceeds EN 13595 requirements in abrasion resistance, impact testing, and seam bursting for CE certified personal protective clothing. 100% cotton denim jacket with cotton corduroy collar. 100% cowhide leather on front and back yoke. Two chest pockets and two lower front pockets with rivet details. 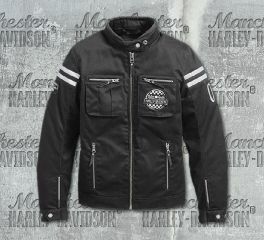 Metal badge on right chest, metal HARLEY® clip on placket and embossed canvas patch on back right waist. 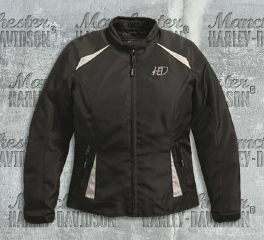 Wear the blend of contemporary and classic to your Harley-Davidson® riding jacket. Made of abrasion-resistant 100% polyester, this jacket delivers the goods and then some. Get more protection with EN 1621-1 CE-approved removable body armor at elbows and shoulders. Add even more protection with body armor pocket in the back, with CE Level 1 Back Armor (98150-17VR, sold separately). The removable liner means you can ride year-round. 3M Scotchlite Reflective Material graphics on front and back make you visible at night to traffic. Bring convenience to your ride with this functional jacket. Made of abrasion-resistant three-layer soft shell 95% polyester, 5% spandex, with a removable full-sleeve hoodie for extra warmth. Off the bike, wear the cotton/polyester hoodie as a standalone statement. On the bike, stay protected with EN 1621-1 CE-approved removable body armor at elbows and shoulders. When it’s warm, the jacket’s front and back vents keep air moving freely to keep you cool. With a military feel on your Harley® pride riding wear. Made of abrasion-resistant 60% cotton and 40% polyester serica PU for some serious riding. Vents on the shoulders and back keep air moving when it’s warm outside. 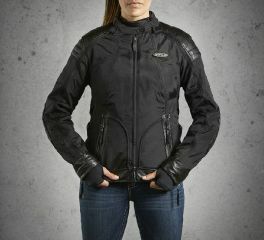 And with a removable liner, this jacket is for year-round riding. Power-stretch sides for easier movement. Denim done better. 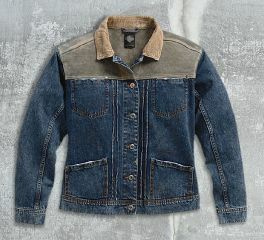 We amp up this jean jacket with a unique water-resistant finish then load it up with functionality. The Quilted Coated Denim Riding Jacket includes armor pockets, vents, reflectivity, and way more (read the bullets). This women's textile motorcycle jacket transitions from saddle to sidewalk with zero effort so it continues to get excellent mileage even after you park. There's an easy solution to conquering chill without getting weighed down. Reach for our Soft Shell Mid-Layer Jacket. Ideal for under riding gear, it delivers lightweight and windproof defense without bulk. And to keep you from overheating, the contrasting black panels allow airflow when you vent your riding jacket. Great to wear on its own as a women's casual jacket, too.